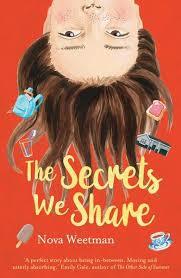 The Secrets We Share is the follow up book to The Secrets We Keep. It easily stands alone but oh gosh, it’s a beautiful extension of Clem Timmins’ progression from primary school to high school. In profound parallel, the rebuilding of Clem’s family home mirrors the emotional rebuild of her life and that of her mother’s. This touching story explores changes and the ways those changes shape us. It is not always easy getting back on top of things, as show metaphorically with Clem’s foray into ‘roof topping’, but Clem really tries despite her ever-plummeting sense of self-esteem. Tween-aged Clem is impossible not to adore. We feel every heartbeat of her anguish and dejection; you’ll want to reach out and grab her hand and tell her to hang on. 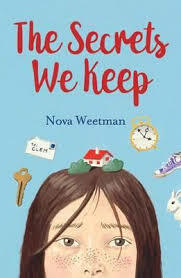 These books are the perfect read for all those young people crossing over from childhood and primary school (and perhaps far worse things) into a more furtive and sometimes confusing world. Both books are utterly entrancing. I loved them. So will older primary aged readers. Jorge is sweet and sensitive with a core of goodness only he doubts. Yet he exists in a barrel of rottenness, fettered to a life of homelessness, petty crime and abject poverty in the heart of one of Europe’s most affluent cities, Paris. Unable to see a way to climb out of his life within the cardboard shantytown in which he lives, he never loses sight of his dream, to one-day escape and learn how to cook. He guards his secret hopes under a cloak of fear and apprehension until he meets the exuberant Aussie chef, Sticky Ricky who might just be the one to help Jorge win his fight to live. Webster has come into her own with this tale of survival, child trafficking and endurance. 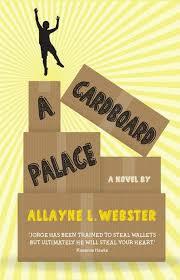 A Cardboard Palace is a story about emerging from small, sordid places and reaching for the light of something greater. Jorge and his friends experience realities so harsh it will make your heart bleed and your mind question humanity yet their story chimes with such well-executed mirth and poignancy, it is an absolute pleasure to read. Full marks. We’ve all experienced stories that attach themselves to you so permanently, you can’t get them out of your head days or even years after reading them. I’d heard this was one of those stories. I am always a bit wary of psychological mind-bending thrillers (my mind is so easily bent); however I blithely avoided all other claims and dived right in for myself. Well, the spin doctoring was deliciously spot-on. Epstein’s portentous narrative is high-wire taunt and just as nerve wracking. Her characters are so legit; I could almost smell their rank fear and confusion. 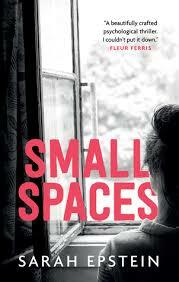 The escalating mental anguish of claustrophobia-suffering Tash pulls like a magnet. I so wanted to believe her version of the abduction of a young girl from a small town carnival by her so-called make-believe friend, that every indication to prove otherwise totally rattled me. The countless diversions and sinister sidetracking were a mystifying, terrifying joy to navigate. Tash is a seventeen-year-old girl, forging headfirst into her last year of high school, desperate for a normal grown up life. The only trouble is she cannot shake the trauma of witnessing the abduction of six-year-old Mallory Fisher by her repugnant imaginary friend, Sparrow. No adult has ever believed her version of events. Years of therapy have only supressed disturbing memories rather than abolished them. Now, some nine years later, Sparrow resurfaces leaving Tash to dissect old fears and memories all over again in an effort to learn if it is him or her everyone should fear. Superlative psychological suspense for teens from 14 years and above.